If the word glamping has you rethinking your relationship with the outdoors, you’re not alone. Glamping has grown exponentially in popularity in the past few years, encouraging more and more families to immerse themselves in the outdoors without sleeping on the ground. Last year, I embarked on my first Vermont glamping adventure and wrote my first post about that delightful experience – a cabin camping adventure in northern Vermont. Since then, I have made glamping all over the country my personal mission. Glamping offers a whole lot of convenience that I’ve learned to embrace. After just a year in the game, I’ve explored cabins, yurts, bell tents, and treehouses all over the northeastern United States, but I’m always adding more to the list, especially in my home state of Vermont. This week I spent some time exploring Glamping Hub looking for that perfect dog-friendly vacation rental in Vermont. I totally found it, and I added a few more Vermont properties to my glamping bucket list. Please note: This post is sponsored by Glamping Hub, who also provided the photos below. Between the beautiful three-bedroom cottage and the secluded, wooded property where your dog can run off-leash, this may just be the ideal wilderness getaway. This Vermont retreat is situated on the very edge of the Green Mountain National Forest — you can walk out the door and onto forested trails that will keep you out all day. Two of our favorite Vermont State Parks, Lowell Lake and Emerald Lake, are within 15 minutes — both are awesome for paddling and swimming. Family-friendly amenities at this sweet Vermont cottage include Wi-Fi, a washer/dryer, and a bocce ball court. Read more about this Landgrove cottage on Glamping Hub. Gorgeous mountain views are the highlight of these two beautifully rustic cabins in Royalton, Vermont. Wide open spaces, private hiking trails, and a pond for splash-happy dogs are just a few of the perks of this property. Two cabins can be rented separately or together — sleeping two and three people, respectively. Sparkly night skies, a cozy gas fireplace, and a full kitchen mean you can hunker right down in your slice of Vermont heaven. If you feel the need to explore, be sure head into downtown Royalton, where you’ll find The Worthy Burger (a must visit), a great natural food co-op, and exceptional swimming in the White River. 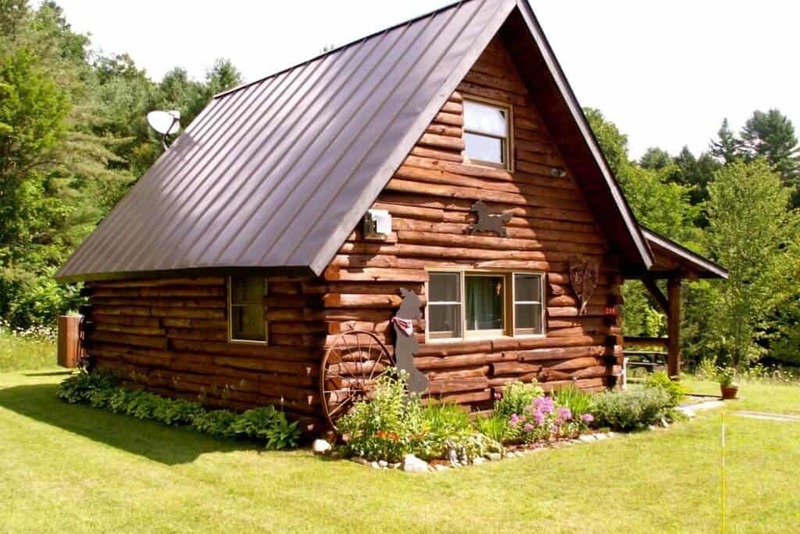 Book your mountain view cabin in Vermont on Glamping Hub. Located in the southwestern corner of Vermont, this ultra modern retreat boasts a beautiful pool for summer fun and a hot tub for winter relaxation. 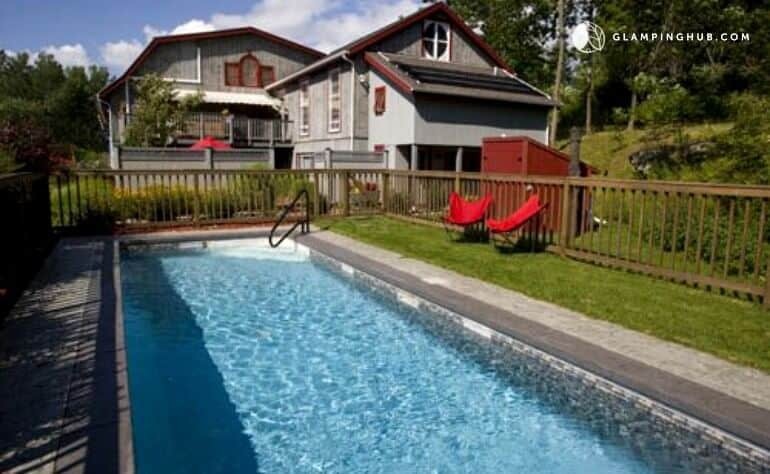 There are two bedrooms and two bathrooms, with room for eight people and your dog too! Special touches include a fully equipped kitchen, a media room with a satellite TV and DVD player, and a wood-burning stove for cozy winter evenings. There are endless opportunities for outdoor exploration nearby, including the Appalachian and Taconic Crest trails, Woodford State Park, and the Hoosic River (for fishing and paddling). 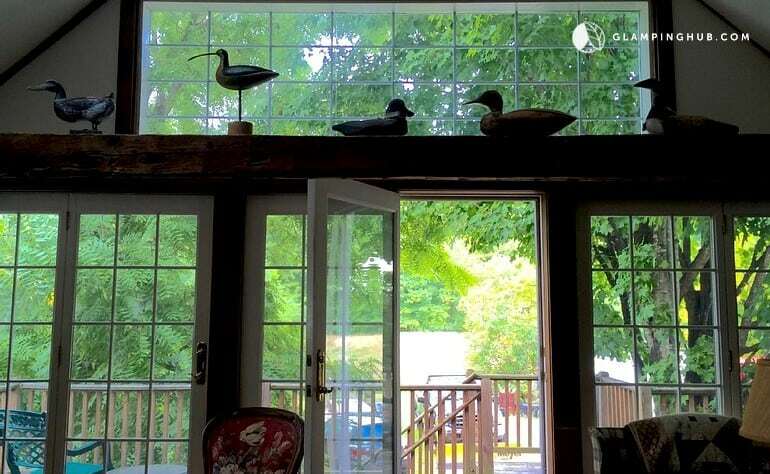 The nearby towns of Williamstown and Bennington both offer lots of dining and shopping opportunities, making this barn rental a great home base for all kinds of adventures. Want to read more? Read our review of the perfect southern Vermont vacation rental. Built in 1799, this spacious rental comes with plenty of rustic charm and beds for up to 10 people (and dogs too, of course). Amenities include a full kitchen, cozy fireplace, Wi-Fi, and a dishwasher. Chester is located in the heart of the Green Mountains of southern Vermont, and the property is located right on Main Street for easy access to shopping and dining. 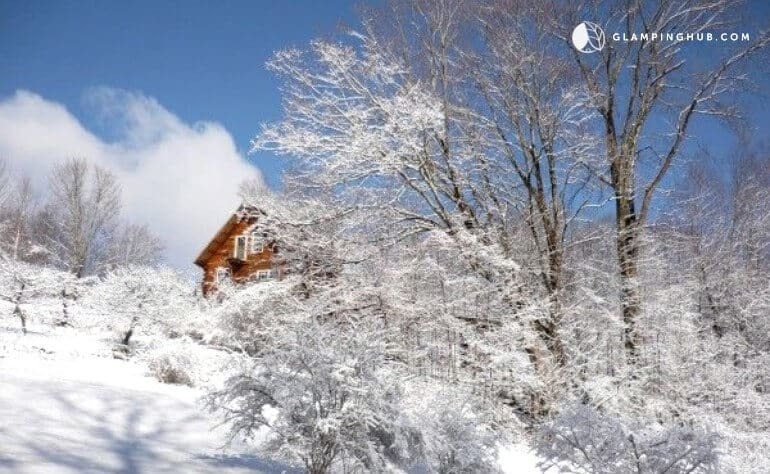 This awesome getaway is located within 30 minutes of Okemo and Magic Mountain Ski Resorts and just seven miles from the world-famous Vermont Country Store in Rockingham. For in-town hiking, you can’t beat the Lost Mine Trail, which is a 2.1-mile moderate loop past old stone walls, and yes, even a lost mine. Read more about this pet-friendly renovated barn on Glamping Hub. The town of Rupert has already stolen my heart, so it didn’t take much convincing to add this gorgeous cabin to my glamping bucket list. 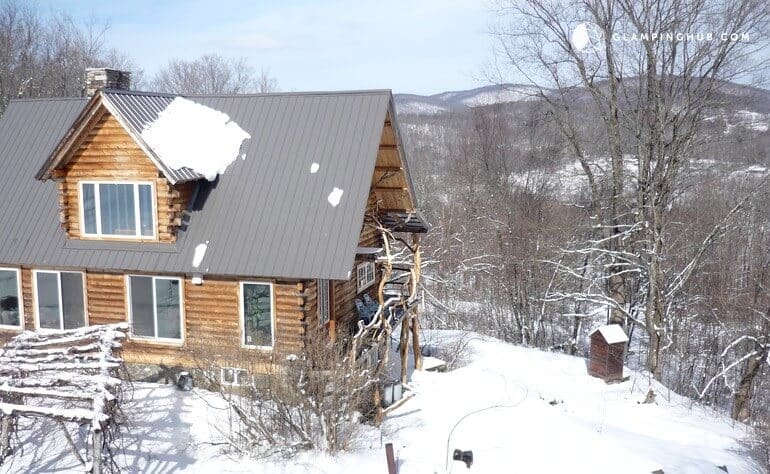 With room for 10 people and their favorite pets, this log cabin is perched on a hill with fabulous views of the surrounding Green Mountains. Luxurious amenities include three bedrooms, three bathrooms, a wood-burning furnace, and Wi-Fi. The dining area seats 15 comfortably, and there is plenty of room inside and out for relaxing. Rupert is a rural community and home to Merck Forest and Farmland Center, which is a fabulous destination for hiking and exploring the fields and forests of southern Vermont. Oh, and they’ve got farm animals too! Ready to learn more? 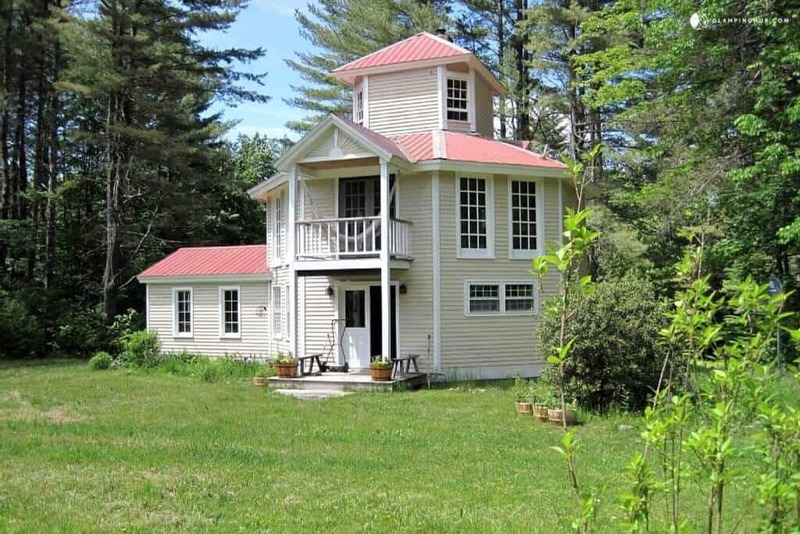 Check out this secluded getaway in southern Vermont on Glamping Hub. Planning a trip to Vermont for some winter fun? Want to include your pets in your vacation plans? These beautiful properties are perfect for pet-friendly glamping. Experience all the fun the outdoors has to offer, and indulge in a cozy retreat to call home for a night, a weekend, or even longer. If the Vermont glamping properties above haven’t triggered your wanderlust, I would definitely encourage you to check out Glamping Hub’s Vermont portal for more options. For more of our favorite properties, check out The Best Winter Glamping in New England. Glamping is still something completely new to me. I am used to hiking and staying in a tent, but this look so really nice. Especially if you want to take your pet along. Sometimes it can be difficult to get someone to look after them when you are away. Great article and thanks for all the great suggestions! Bringing your pets along is definitely the best part about it, at least in my opinion! One of the worst parts of owning a pet is wanting to go on vacation only to realize that nowhere accepts animals and you have to leave the lovable little ball of fur at home. This is a great list of Animal friendly glamping locations, keep it up! I agree. Although we have great pet sitters, I definitely prefer bringing my dog with me when I travel. So many wonderful glamping locations. I am always confused as to what glamping actually means. I didn’t realize that staying in a cabin was glamping 🙂 I just assumed glamping was a nice tent. I love traveling with my pet, so this is so perfect! I think that glamping was originally thought of as a fancy tent with a real bed in it, but now the definition has been stretched to include all kinds of lodging with a strong emphasis on outdoor living spaces. These are great. I love traveling with my big chocolate lab. He is 10 now and does not like being left behind.